Have you dreamed of that wonderful skill cape? Have you wondered how that level 230 Steel Titan would make your opponents tremble? This guide will give you a few ways of becoming a master of Summoning. This section will give you a few useful ways to cut down on your training time or save some money! Thorny Snail - 3 slots (level 13). Spirit Kalphite - 6 slots (level 25). Bull ants - 9 slots (level 40). Spirit Terrorbirds - 12 slots (level 52). War Tortoise - 18 slots (level 67). Pack Yaks - 30 slots (level 96). By using some familiars, you can run a lot longer. Just use a scroll of the familiar and it will restore a part of your run energy (based on your agility level). Spirit shards cost 25 gp in Summoning stores, but you can also buy them off players. Visit the official runescape forums and try to buy some shards for a discount price! If you give your pouches to Bogrog, an ogre in Gu'Tanoth, he will give you back 70% of the shards needed to make that pouch. Note: You must have a higher Summoning level to swap the pouches then to make them (starting at level 11). If your level is under 21 you will need 10 levels more then required to make the pouch to swap your pouch. There are a few Summoning Obelisks which you can use to make pouches. This section will tell you how to get to them as fast as possible! The routes are arranged from fastest to slowest. Spirit Kyatt pouches (Requires 57 Summoning). Teleport to a bank (eg. Glory, Falador teleport). Get all of your items out and summon your Spirit Kyatt. Talk to your familiar and let him teleport you to the Piscatoris Hunting area. Now you're only a few steps away from a Summoning obelisk. Go down the ladder and create your pouches. Then teleport to a bank. 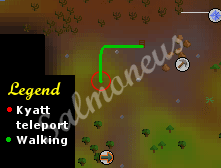 Edgeville (Glory amulet or mounted glory). Canifis/Kharryl (Ancient spellbook or a Kharyll teleport in your POH). Seers Village (teleport to Camelot runes, Camelot teletabs). Falador (teleport to Falador runes, Falador teletabs). Enough coins to sell and re-buy your items. Have all of your items noted with you, together with a bundle of cash. Sell your items to Dal and quickly re-buy them (before other players buy them). Then, just walk to the Summoning Obelisk. When you're done making the pouches you can either: Sell them to the general store, swap them for spirit shards, make them into scrolls or high alch them. Unlocked the Castle Wars balloon route. Either one yew log or a Ring of Duelling. This is also a fast option. The hot air balloon will let you travel from the bank in Castle wars to the Summoning obelisk in Taverley for one normal log. You can use a Ring of Duelling to get back to castle wars (recommended) or you can pay up 1 yew log and travel back by balloon. Note: The hot air balloon has a weight limit of 40 kg. When making pouches that require heavy tertiaries, this route may be unavailable. A house in either Brimhaven or Taverley. A Kharyll teleport or a mounted glory. A teleport to a bank. 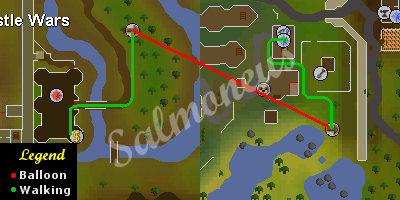 This route will use your Player owned house to easily go to Taverley to make pouches. 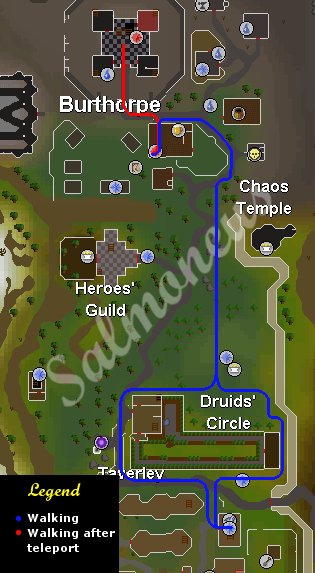 First get your supplies out of your bank and teleport to your house by either breaking a teletab or just using runes. Exit your house and you will be in either Brimhaven or Taverley (Depending on where you placed your house). Then walk to the summoning obelisk and make your pouches. After that is done, you will have a few ways to bank. Completed the Swan Song quest. This route is also very easy, but it requires a pretty hard quest. 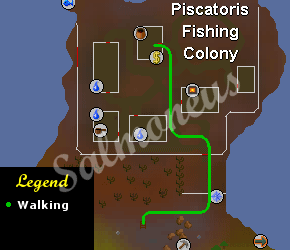 All you have to do is bank in Piscatoris, and then walk to the summoning obelisk. Completed the Shilo Village quest. Start out in the Shilo Village bank and get out all of your supplies out, including 10 gp. After you have everything run to Vigroy and pay him so he will give you a ride on his cart. After you're done riding, run (or walk) to the Summoning obelisk and make your pouches. Then either walk back or use the teleport on your Karamja gloves (3). You also won't have to waste inventory space and money on teletabs or runes. A lot of games necklaces. Use your Games Necklace to teleport to Burthorpe, then withdraw your stuff in the Rogues' Den bank. 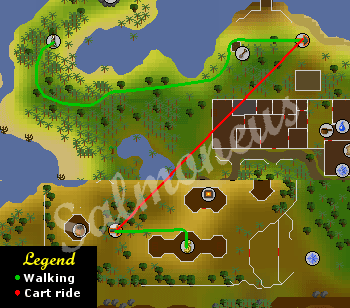 Now simple walk to Taverley and go to the obelisk in Pikkupstix' house. When you're done, teleport to the Burthorpe Games room and start over again. 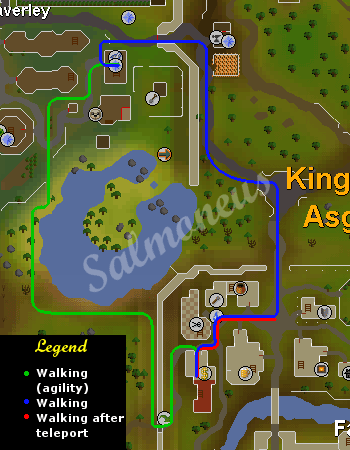 5 Agility if you want the quicker route. Air staff with water and law runes or Falador teletabs. This method is one of the easiest and requires almost nothing. It's the preferred choice for low leveled players that haven't done any of the harder quests to get the traveling benefits. 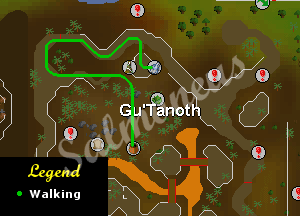 This section will tell you to how to get 99 Summoning the fastest way possible. The disadvantage is, is that it will cost a whopping 120 Million+! Note: The costs of getting tertiaries are not included since you can choose to get them yourself or buy them and because their price is always changing. After you have completed the Wolf Whistle quest you will be level 4 Summoning and you will have received 275 Gold charms. There are two ways. You can either go for Dreadfowls all the way, or switch to Spirit Spiders at level 10. For the first method buy 266 blank pouches, gold charms, raw chickens and 2,128 shard which will cost you around 53.5k and start making Dreadfowl pouches until level 16. The other way requires 95 blank pouches, gold charms, raw chickens and 760 spirit shards to get to level 10. This will cost around 19k. Then 127 blank pouches, gold charms, spider carcasses and 1,016 spirit shards will get you to level 16. This will cost 45k. Note: It is wise to save up all your blue charms for higher levels. Don't waste them yet! At level 16 start making Granite Crab pouches until level 19. You need 57 blank pouches, gold charms, iron ore and 399 spirit shards. This will set you back around 10k. The best method would now be to get a lot of crimson charms and make Spirit scorpion pouches until level 31. This requires 131 blank pouches, crimson charms, bronze claws and 7,467 spirit shards. That will set you back a whopping 188k. If you want to use some green charms along the way you can make Compost Mounds at level 28. At this stage we will go with Vampire bats because they give good experience and their tertiaries are easy to gather. Costs? 791.7k. Spend your money on 391 blank pouches, crimson charms, vampire dusts and 31,671 spirit shards. If you want to spend a little less you can make Bull Ants using Gold charms at level 40. If you want to use your Green charms you can make Beaver pouches at level 33 and Macaws at level 41. These two do cost a bit more and give less experience per shard then Vampire Bats. Pyrelords until 49. This will require 118 blank pouches, crimson charms, tinderboxes and 13,098 spirit shards. Totaling at 327k. If you want to use some of your Green charms along the way, make Magpie pouches. These cost a bit more and are slower. Yes, you read it right. This is going to be a long way. Bloated Leeches are the fastest because of their good experience and easy to gather tertiaries. You will need 1,466 blank pouches, crimson charms, raw meat and 171,522 shards. This will cost 4.28 million If you want to use other charms besides crimson and you want to keep your costs down you can make Spirit terrorbirds (Gold Charms - level 52). If you want to use Green charms you can make Ibis pouches at level 56. This pouch is slower and more expensive. Now we're going to make some Stranger Plants. Get 2,448 blank pouches, crimson charms, bagged plants and 313,344 spirit shards. Getting to 74 will cost 7.83 million. If you want to use some other charms along the way you can make Bunyip pouches (green charms - level 68), Fruit Bat pouches (green charms - level 69) or Arctic Bear pouches (gold charms - level 71). Now we are going to make Granite Lobsters. This will take 4,843 blank pouches, crimson charms, pieces of Granite (500g) and 803,938 spirit shards. This will be another 20.1 mill. You can also use your other charms on Forge Regents (green charms - level 76) or Giant Ents (green charms - level 78). You are almost halfway, don't give up now! Spirit dagannoth until level 85, and then Swamp Titans. You will need 1,605 blank pouches, crimson charms, dagannoth hides and spirit shards until level 85 (costing you 40k), and then 8,746 blank pouches, crimson charms, salamanders and 218,650 spirit shard until level 92. This will cost 5.5 million. If you want to be (a lot) more cost efficient you can go with spirit dagannoth all the way, saving you a couple of mill! Note: At level 89 use all your blue charms on Geyser Titans. Congratulations! You are now halfway of being a master of Summoning. You will now make Wolpertingers until 95, then Iron Titans and then continue with Pack Yaks. Getting to 95 requires 5,569 blank pouches, crimson charms, raw rabbits, wolf bones and 1,130,507 shards. That will cost around 28.3 million. Then Iron Titans until level 96 requires 2,187 blank pouches, crimson charms, iron platebodies and 433,026 spirit shards, costing you 10.8 million. The final step until 99 requires 7,931 blank pouches, crimson charms, yak hides and 1,673,441 spirit shards. Ending with a 42 million cost. If you were wondering, you spent around 120 Million+ coins using this method! This section is the same as the detailed one, but with only the requirements. 266 blank pouches, gold charms and raw chickens. 93 raw chickens and 127 spider carcasses. 57 iron ore and gold charms. 131 bronze claws and crimson charms. 391 blank pouches, crimson charms and vampire dusts. 118 blank pouches, crimson charms and tinderboxes. 1,466 blank pouches, crimson charms and raw meats. 2,448 blank pouches, crimson charms, bagged plants. 10,351 blank pouches and crimson charms. 1,605 dagannoth hides and 8,746 salamanders. 15,687 blank pouches and crimson charms. 5,569 raw rabbits and wolf bones, 2,187 iron platebodies and 7,931 Yak hides. 35,714 - 35,734 blank pouches. 279 - 393 gold charms. This section will give a few ways of getting 99 Summoning without losing too much money. Granite Crab pouches until level 40 is the most cost efficient. You will need 1,597 blank pouches, gold charms, iron ore as well as 11,179 spirit shards. This step will cost 280k. This method is a little more costly but faster. Make Granite Crab pouches until level 19, then you will switch to Spirit Scorpion pouches. This will require 57 blank pouches, gold charms, iron ore and 399 spirit shards to get to level 19. Then 131 blank pouches, crimson charms, bronze claws and 7,467 spirit shards will take you to 31. Another 200k down the drain. At this stage Summoning you can go with Vampire Bats because they give good experience and their tertiaries are easy to gather. Gather 165 blank pouches, crimson charms and vampire dust as well as 13,365 spirit shards. Costs? 334.1k. If you want to use your Green charms you can make Beaver pouches at level 33. Beaver pouches cost a bit more and gives less experience per shard then Vampire Bats. Here there are two ways. The first is to continue with Granite Crabs, this is slightly more expensive. The other way is to go with Bull ants. The problem is, is that the tertiary (Marigold) is expensive, and hard to make yourself (in bulk). For Granite Crabs all the way you'll need 4,002 blank pouches, gold charms, iron ore and 28,014 spirit shards. This step will set you back 700k. The faster and more cost efficient way is to make Bull Ant pouches. 1,638 blank pouches, gold charms, marigolds and 18,018 spirit shards are needed. This will cost 452k. If you want to use some of your Green charms along the way, make Magpie pouches. These cost a bit more and are slower. This is going to be a slow way, but it really saves a lot in costs. Spirit terrorbirds are the way to go now. 14,220 blank pouches, gold charms, raw bird meats and 170,640 spirit shards are needed. This long and hard step will take 4.28 million coins. You can also use Bloated Leeches to level. These are a lot faster, but do cost a lot more. Note: As soon as you reach level 86 you can use all of you spare blue charms to make Rune minotaur (most cost efficient) or you can make Geyser Titans at 89 (Best experience). This isn't described as a main method since the blue charms are not common drops. We will choose Spirit Dagannoths because of their good experience gain and their amazingly low spirit shard cost. 28,403 blank pouches, crimson charms, dagannoth hides and spirit shards are needed to get to 99! This will cost a mere 740k! If you feel like dagannoth hides are too hard to gather, you can try to use Spirit terrorbirds. These are 6 times slower to make, but the tertiary is a lot faster to gather. An amazing 151,482 blank pouches, gold charms, raw bird meats and 1,817,784 spirit shards are needed. 45.6 million is the price you will pay for getting 99 Summoning. On your way you can also make Granite Lobsters (crimson charms - level 74), Swamp Titans (crimson charms - level 85), Wolpertingers (crimson charms - level 92), Iron Titans (crimson charms - level 95) and Pack Yaks (crimson charms - level 96) to speed up your training (but spend more cash). If you want to use other charms besides crimson you can make War Tortoises (gold charms - level 67) or Unicorn Stallions (green charms - level 88). Note: When you reach level 86 you can use all of your blue charms on Rune Minotaurs or use them at level 89 on Geyser Titans. Rune minotaurs give more experience per shard, but Geyser Titans tertiary is a lot less expensive. This way has cost you around 26.4 - 71.3 Million. 95 raw chickens and 127 spider carcasses. 1,597 blank pouches, gold charms and iron ore.
57 gold charms and iron ore.
131 crimson charms and bronze claws. 165 blank pouches, crimson charms and vampire dusts. 4,002 blank pouches, gold charms and iron ore.
1,639 blank pouches, gold charms and marigolds. 14,220 blank pouches, gold charms and raw bird meat. 4,843 blank pouches, crimson charms and pieces of Granite (500g). 28,403 blank pouches, crimson charms, dagannoth hides and spirit shards. 151,482 blank pouches, gold charms and raw bird meats. 49,680 - 76,401 blank pouches. 16,136 - 20,085 gold charms. 32,885 - 33,050 crimson charms. 1,053,998 - 2,853,727 spirit shards. This part of the guide will tell you how to train Summoning with the least amount of money. After you have completed the Wolf Whistle quest you will be level 4 Summoning and you will have received 275 Gold charms. The way to go now is Dreadfowls. This requires 93 blank pouches, gold charms, raw chickens and 760 spirit shards to get to level 10. Spirit Spiders then cost 127 blank pouches, gold charms, spider carcasses and 1,016 spirit shards which will get you to level 16. This will cost 45k. You can now switch to a new method, or wait one level and use the cheapest method possible. For just one level, Granite Crabs require the least amount of money. 30 blank pouches, gold charms, iron ore and 210 spirit charms (costing 5,250 gold coins). This is the absolute cheapest way on your way to 99. Mosquitos will require 11,717 blank pouches, gold charms, proboscis and spirit shards to get you to level 67. This will only cost 293k! Granite Crab pouches until level 40 is a bit more costly, but the tertiary is much easier to gather. You will need 1,597 blank pouches, gold charms, iron ore as well as 11,179 spirit shards. This step will cost 280k. The faster and more cost efficient way is to make Bull Ant pouches. 1,639 blank pouches, gold charms, marigolds and 18,018 spirit shards are needed. This will cost 452k. For this step you'll need 6,204 blank pouches, gold charms, raw bird meat and 74,448 spirit shards. You'll be making Spirit Terrorbirds until level 67. This will cost around 1.86 mil. Another long step, but that's what you get for choosing the cheapest way! War Tortoises will cost you 36,266 blank pouches, gold charms, tortoise shells and spirit shards to you to 83! This will cost 907k. Now, Spirit Dagannoths all the way! Dagannoth hides are hard to get, so you might want to continue with War Tortoises. For Dagannoths all the way you'll need 28,403 blank pouches, crimson charms, dagannoth hides and spirit shards costing you 720k. If you want to stick with War Tortoises (slightly slower and more costly, but easier to gather tertiaries) you'll need 161,035 blank pouches, gold charms, tortoise shells and spirit shards. This will total to 4.02 million. Note: When you reach level 86 you can use all of your blue charms on Rune Minotaurs. These will cut down on your shard cost, but since their tertiary is expensive Geyser Titans at level 89 would also be a good way. This slow but cost effective step has cost you 2 - 5.9 million! This section is the same as the detailed one, but only with the requirements per levels. 220 blank pouches and gold charms. 250 blank pouches and gold charms. 93 raw chickens, 127 spider carcasses and 30 iron ore.
11,717 blank pouches, gold charms, proboscis and spirit shards. 18,018 - 312,928 spirit shards. 6,204 blank pouches, gold charms and raw bird meats. 36,266 blank pouches, gold charms, tortoise shells and spirit shards. 161,035 blank pouches, gold charms, tortoise shells and spirit shards. Of course you don't have to train Summoning to actually level it. You can also use random events, quests and experience lamps. Note: You have to have finished Wolf Whistle to gain experience in Summoning. Darkness Of Hallowvale: 6,000 exp. A Tail Of Two Cats: 2,500-5,000 exp (Must be over level 30). The Great Brain Robbery: 5,000 exp (Must be over level 30). A Fairy Tale Part II: 2,500 exp (Must be over level 30). One Small Favour: 10,000-20,000 exp (Must be over level 30). Legacy of Seergaze: 2500-5000-7500 exp. (Must be over level 35). King's Ransom: 5,000 exp (Must be over level 50). Recipe for Disaster: 20,000 exp (Must be over level 50). Tears of Guthix (only if Summoning is your lowest skill). Two 500xp lamps you get after completing and returning the test in the Stronghold of Player Safety, also known as The Misthalin Training Centre of Excellence (the lamps are available in free-to-play and pay-to-play). These lamps can be banked, but do not stack in the bank, unlike almost every other item in the game. Karamja Diary rewards - After completing the easy tasks, you will receive a lamp which grants you 1,000xp, medium and hard lamps give you 5,000 and 10,000xp respectively. The Varrock Museum gives out 3 antique lamps granting 1,000 exp each in any chosen skill above level 20, and a fourth which grants 10,000 exp in any chosen skill above level 50. Magic Lamp from the Genie (exp = skill level * 10). Book of Knowledge from the Surprise Exam (exp = skill level * 15). If you're looking at this guide then you are probably wondering what Summoning can do for you! The first thing you're going to want is that awesome cape of accomplishment. This cape will show that you are a true master of Summoning. 99 Summoning and 99k to buy it off of Pikkupstix is needed. This cape will also boost your Summoning by 1, when you operate it. Getting a high Summoning level is very useful. You can use your familiars to do your bidding and to aid you while training skills or making money. Fights: Some familiars can aid you in combat. The most powerful being the Steel Titan at 99. Killing strong bosses like the King Black Dragon or Kalphite queen will be a lot easier with this Titan. Healers: These familiars can heal some of your health. For example a Unicorn Stallion will heal 10% of your health, each time you use a scroll. This is very useful while soloing hard bosses like the ones in God wars dungeon. Light Enhancers: Instead of always bringing a lantern you can also get a familiar to light your way through dangerous caves. One example is the Vampire Bat at level 31. Right-click: Special abilities of your familiars can be activated using the right-click. From gathering ores to aid you while mining or dealing a more powerful attack when fighting a hard monster, Summoning has it all. Skill boost: While using skills you can also have a familiar with you that will help you while training skills. There are two kinds of skills boosts, visible and invisible. Invisible skill boosts will not allow you to do anything above your normal level, they will only improve how successful or how quickly you can perform skill-based activities. A visible skills will let you do things above your level. An invisible boost doesn't show up on your stat page, a visible does. Remote view: When using remote view your familiar will fly up high and let you look through his (or her) eyes. Apart from the beautiful scenery this is also useful while finding your way through a maze for example. The Macaw at level 41 is an example of such familiar. Beast of Burden: Having a bigger inventory is very useful. Some familiars will help you carry items around, which will let you carry more stuff at a time. You can use this while mining or woodcutting, or to increase you profit while Runecrafting (Only abyssal familiars can carry essence). For example, a Thorny Snail will carry up to 3 items for you (if you ask nicely). Forager: Foragers will look for certain items and store them, until you wish to withdraw them. They can store up to 30 items at a time, but you can only withdraw items from them. Compost Mounds will gladly give you a bucket of compost, so that you can farm without having to wait for your food to rot.